(Newser) – This is the other-side-of-the-world counterpoint to the bizarre sight of frozen iguanas in last week's deep freeze in the US: Hundreds of bats in Australia are essentially boiling to death in the nation's extreme heat. 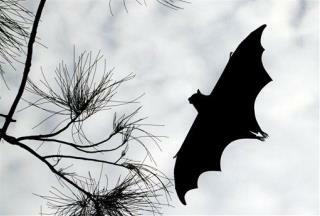 A conservation group near Sydney, where temperatures recently reached 117 degrees, says that more than 400 large bats known as flying foxes were found dead, reports National Geographic. The problem is dehydration, explains one expert on the species. "They can't cool their body down at that point," he says. "In a way, they're kind of boiling in their bodies." This just makes my blood boil. I have a question for the global warming/climate change believers... Most consecutive days above 37.8 °C (100 °F): 160 days; Marble Bar, Western Australia from 31 October 1923 to 7 April 1924 Was this caused by man made global warming? Why hasn't this record been shattered by now? Many more cars/factories now.